My spring break is over and unfortunately I didn't get through my mental "To-Do" list. I had hoped to clean out cupboards, wipe down baseboards and dust blinds, none of this happened. Instead, I watched seasons 1 and 2 of Downton Abbey and I fully well intend on finishing Season 3 by Tuesday. Took a quick weekend trip to visit my 96 year old Grandma. And, I cleaned my office/craft room. These are the before photos. I have way too much stuff. I used to be a Close to my Heart consultant for paper crafting and now I am a Thirty-One consultant for fabulous bags. 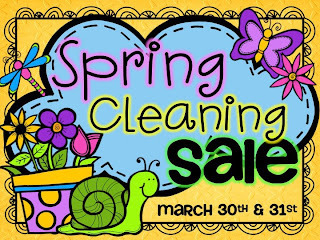 To finish I'm Spring Cleaning my TpT store. Several of my top Selling items and a few of my old favorites are on-sale.